Imagine a creepy encounter with a creepy person at the airport. Imagine that creep scoping out your luggage tag and contacting you at home later. That's exactly what happened to one of our customers in Boise; and that's all the inspiration we needed to take two of our luggage tag products and combine them into one superior product that protects your privacy, while still meeting all TSA requirements for luggage tags. The TSA requires you to place a name and a phone number on each and every piece of your luggage. Both checked and carry-on. And you will want that information on your luggage should it ever become lost. But you don't want any creeps calling you at home. Now you can RELAX knowing that you can safely put all of your personal information on your luggage tags AND keep it safely out of view from all the creeps at the airport. You can meet all TSA requirements with the same high quality Crew Tags® products that you've come to know and trust. And you can do it in complete privacy. 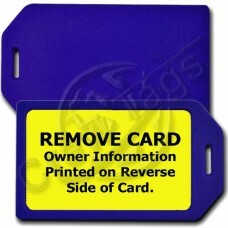 Our Privacy Protection Luggage Tags combine our Business Card Holder Luggage Tag and our very popular Credit Card Style Luggage Tag into one superior product that hides your personal information from the prying eyes of creeps everywhere. 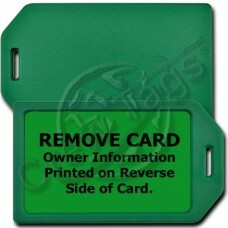 Just choose your favorite color of luggage tag and insert We will print that tag with all of your Top Secret Personal Information on one side, a notice to remove the card to reveal personal information on the other, and we'll package it in a sturdy plastic Business Card Holder Luggage Tag to protect your privacy. This Green Business Card Holder Luggage Tag holds a Metallic Silver PVC insert that is printed with .. 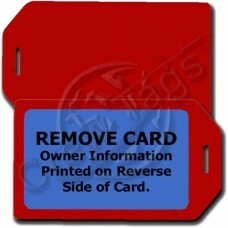 This Red Business Card Holder Luggage Tag holds a Blue PVC insert that is printed with up to 5 lines.. This Red Business Card Holder Luggage Tag holds a Metallic Gold PVC insert that is printed with up t.. This Red Business Card Holder Luggage Tag holds a Green PVC insert that is printed with up to 5 line.. This Red Business Card Holder Luggage Tag holds a Light Blue PVC insert that is printed with up to 5.. This Red Business Card Holder Luggage Tag holds a Red PVC insert that is printed with up to 5 lines .. 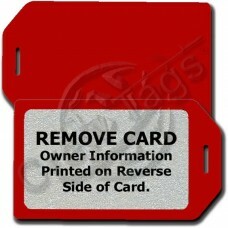 This Red Business Card Holder Luggage Tag holds a Metallic Silver PVC insert that is printed with up..